Are you the kind of person who works off lists? Not just grocery lists but lists for “things to do.” As the holidays kick into gear, that “to do” list seems to grow longer each day with no end in sight. That is why it is important to get out in front of that list whenever you can. Consider the “clear out the junk” task. This could be on the list because of all the accumulated clutter that is scattered around your house. Before visitors come over you want that unwanted rubbish gone, right? Instead of losing an entire day to the task, bring in Junk King Pittsburgh. They’ll have your junk gone in no time at all. When you set up an appointment with Junk King, they’ll send over a team of dedicated workers. This is the pair that is going to remove every item you want gone. It doesn’t matter if something is as heavy as a piano or as cumbersome as an entertainment center. All that matters is that you want it gone. Junk King Pittsburgh knows how valuable your time is and that is what they don’t want to waste it by keeping your waiting around. They only need a two-hour window that allows them to get from one appointment to the next. Most customers have found that not only is Junk King on time but they’re often early. You’ll be given a call when the team is twenty-minutes out from your location. Before you know it, they’ll be in and out with all your junk. The cost for Junk King’s services are all based on volume. It comes down to how the crew will pack your stuff onto the back of the truck. The less room they take up, the less you’ll pay. Shop around and you’re sure to find out that this is the best deal for this type of service in Pittsburgh. That flat fee also covers the disposal of your junk. This isn’t just a run and dump at the nearest landfill. Instead, Junk King will strive to get your discarded stuff dropped off at a recycling center or charity. It’s the perfect junk removal plan. 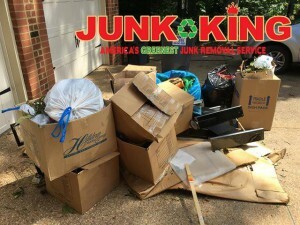 Get ahead of your holiday prep with a junk removal session from Junk King Pittsburgh today. This entry was posted in Pittsburgh Junk Removal and tagged holiday prep, junk, Junk King, junk removal on November 2, 2017 by Junk King. Last updated November 2, 2017 .